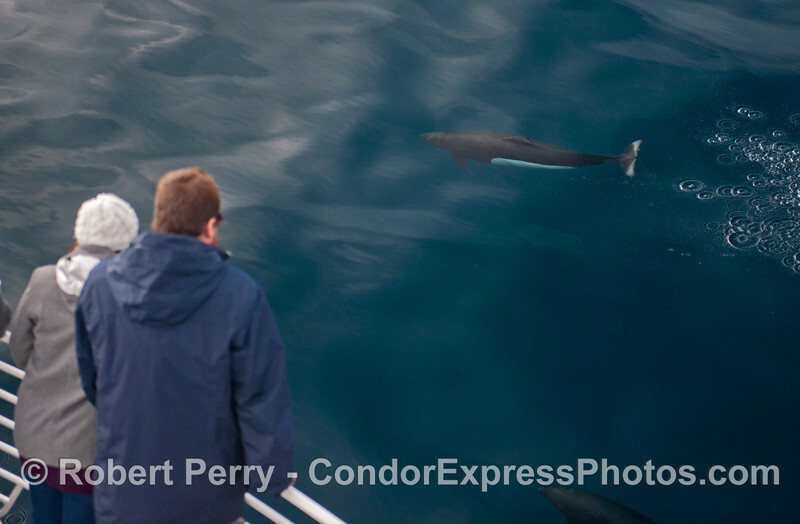 A tiny bit of haze but extremely glassy conditions again today on the Santa Barbara Channel as the Condor Express motored out for another adventure packed trip full of unexpected surprises. 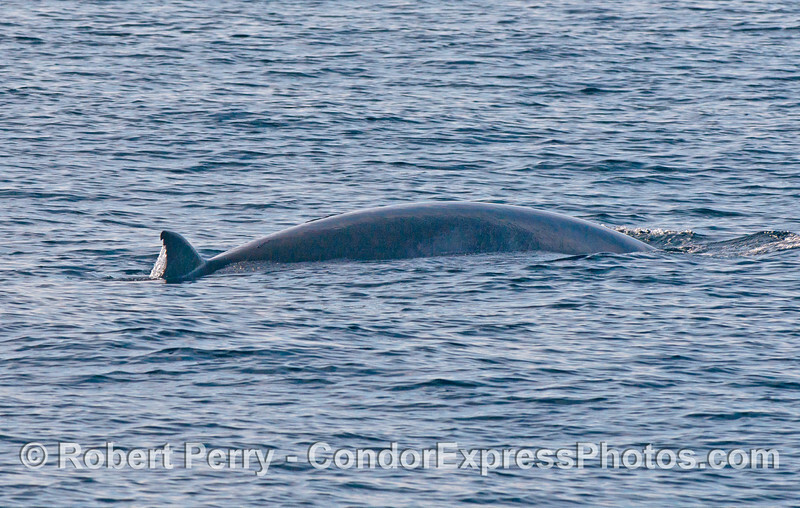 The first surprise of the day was a big pod of 15 or more elusive Dall's porpoise that warmed up to the Condor, rode the bow, and traveled alongside us clearly visible in the crystal clear blue water. 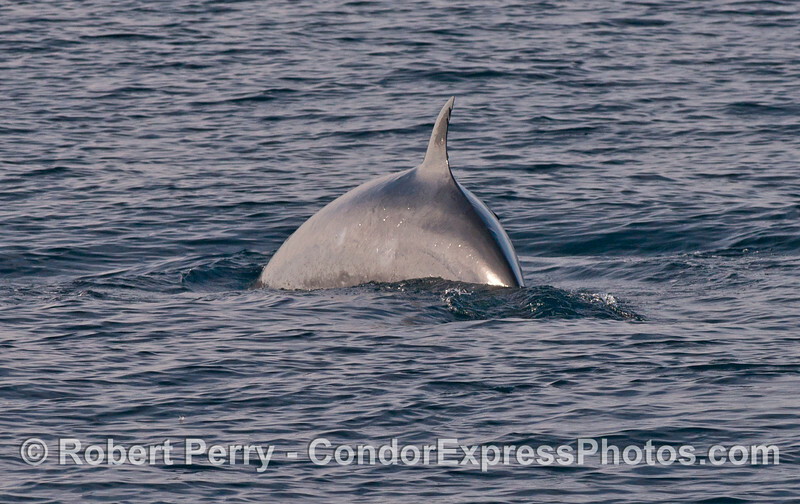 This was a major Dall's sighting, and later we would encounter several other pods of these little bullets for a total of at least 25 for the trip. 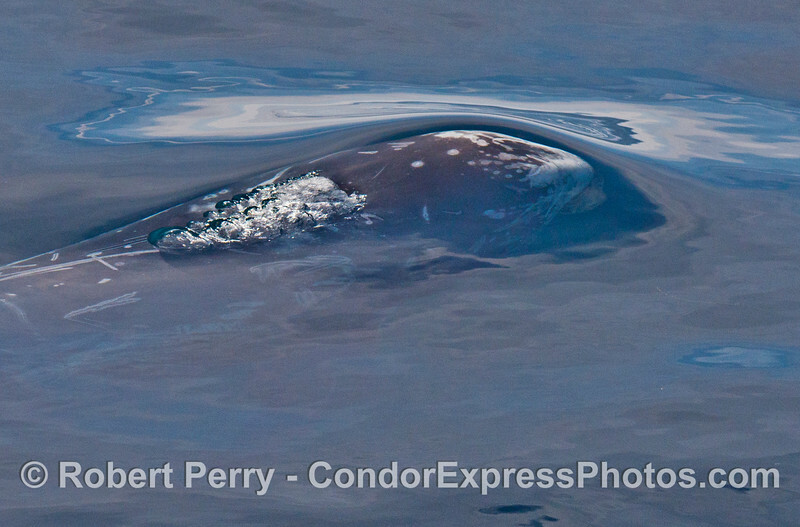 Just inside the commercial shipping lanes we closely followed a tight group of 4 adult gray whales. 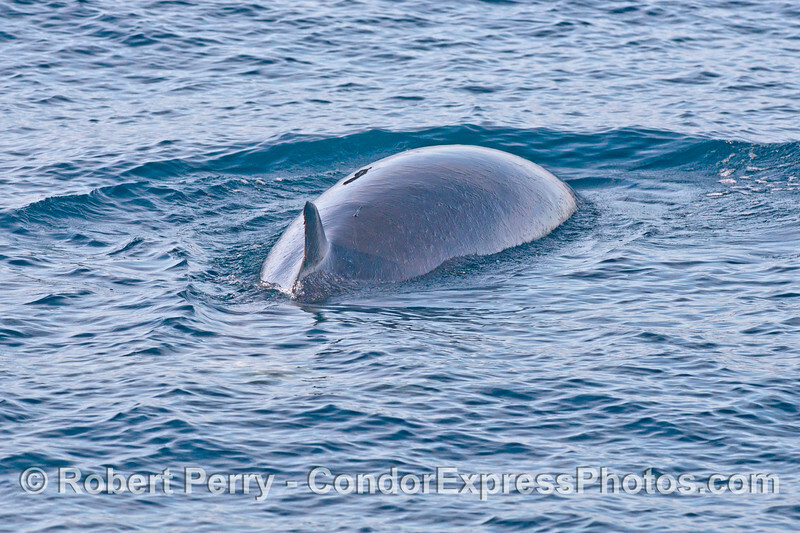 Their down times were pushing 5-6 minutes, but they always surfaced together as a group and always fluked up on the final descent. 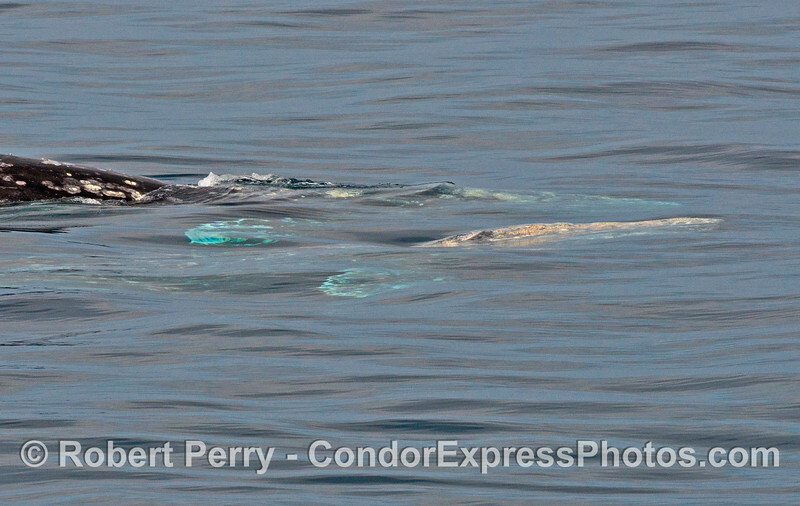 No particular hanky-panky was witnessed, so we don't know if this was formally a "mating pod." 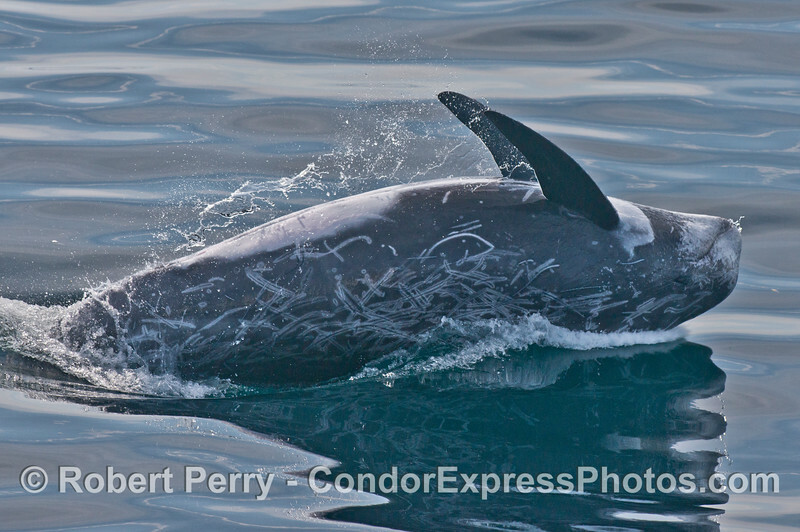 On our way over to the north face of Santa Cruz Island Captain Eric spotted a wide spread area of big Risso's dolphins. 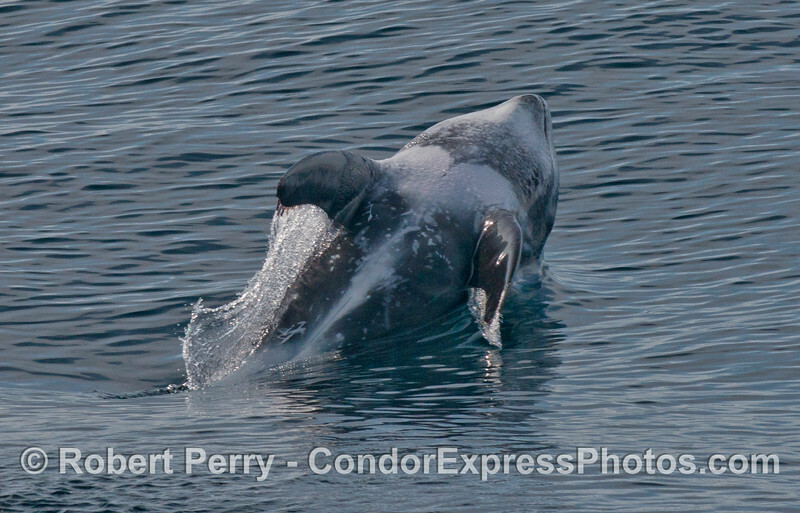 This was another great species to watch, and there was some "social interaction" going on between two of the Risso's causing a lot of surface commotion and ultimately some sideways low level breaching. Very cool. 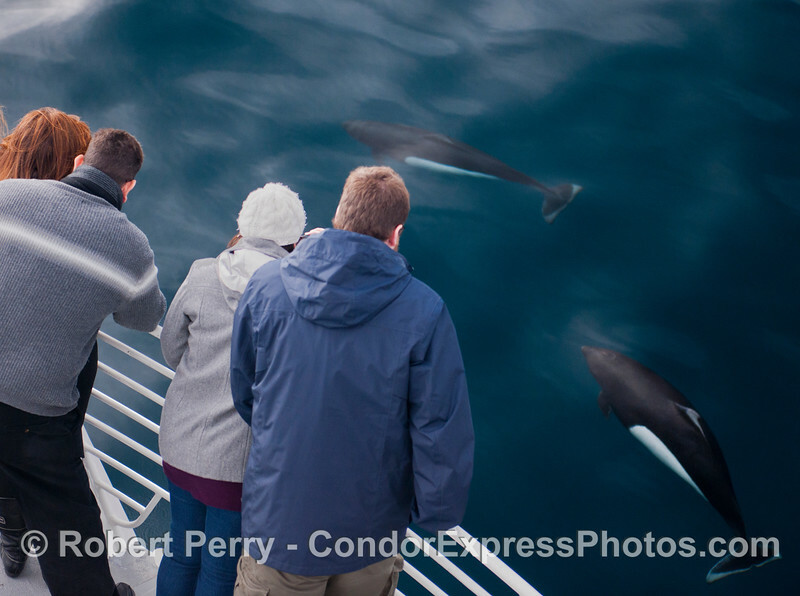 After a great look inside the world famous Painted Cave, a birder on board with us today with great "eagle eyes" eyesight spotted not one, but two bald eagles perched on the volcanic sea cliffs right next to the Cave. The two turned out to be Santa Cruz Island eagles #49 and #64, and they were sitting within a few feet of each other making for some spectacular views and photos too. 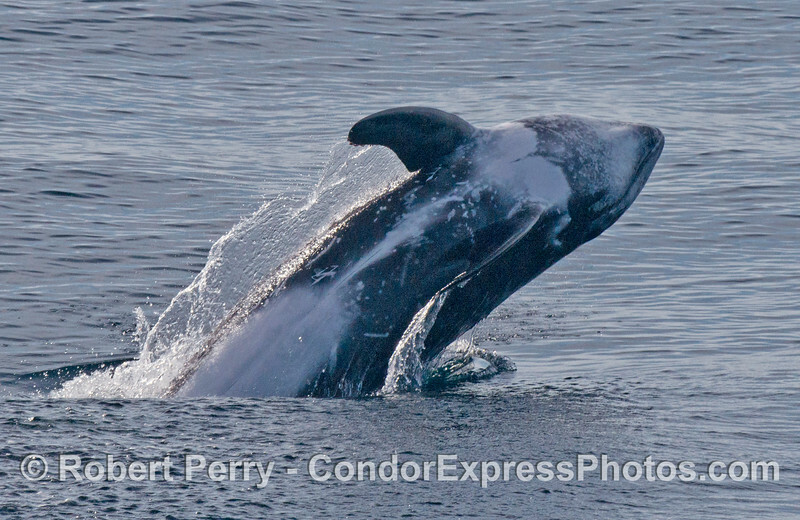 More Risso's and even more Dall's porpoise were seen on the trip back to Santa Barbara, still on a mirror glass surface in the afternoon. You can see a map for today's adventure at the bottom of this page. 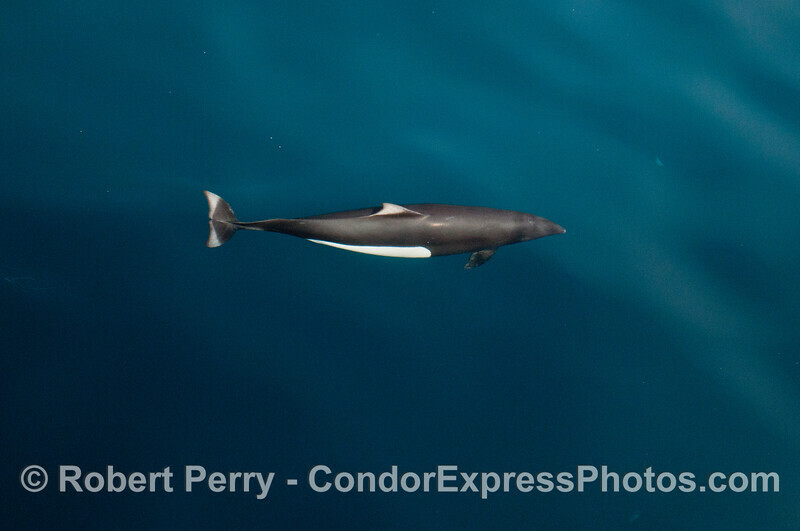 Looking down into clear blue water at a little high speed torpedo, a Dall's porpoise (Phocoenoides dalli). 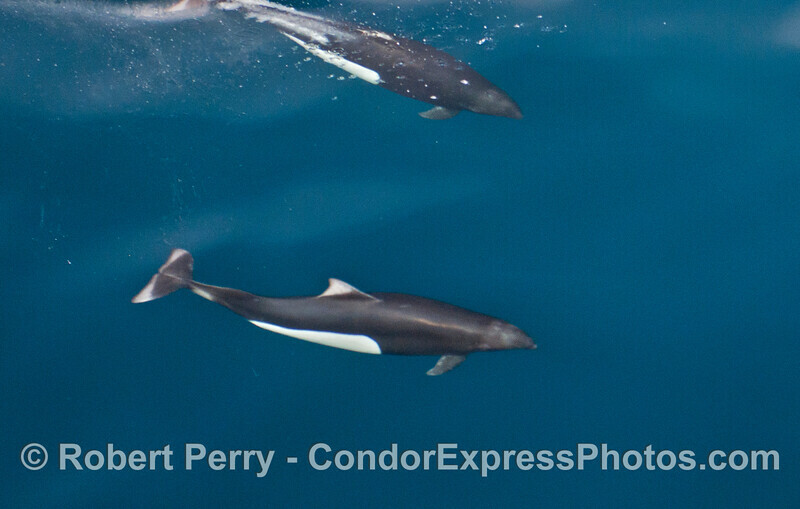 Two Dall's porpoise (Phocoenoides dalli). 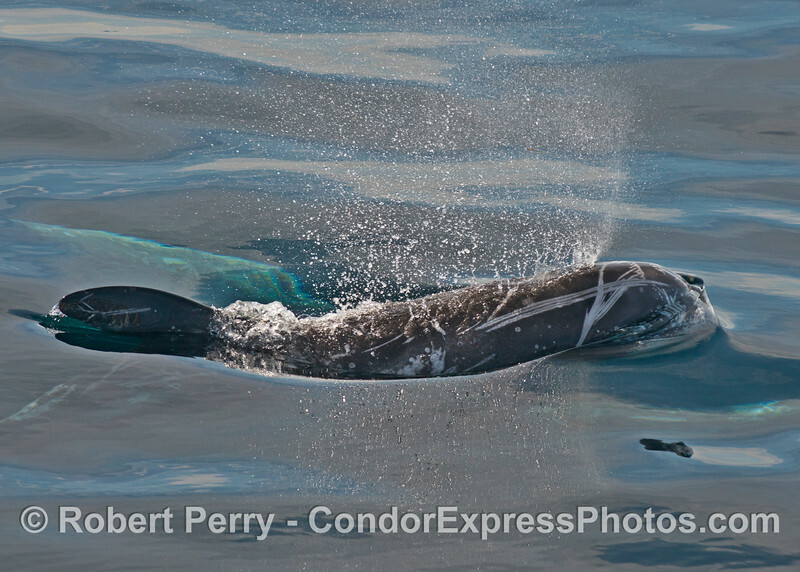 Two Dall's porpoise (Phocoenoides dalli) take a dive in blue water. 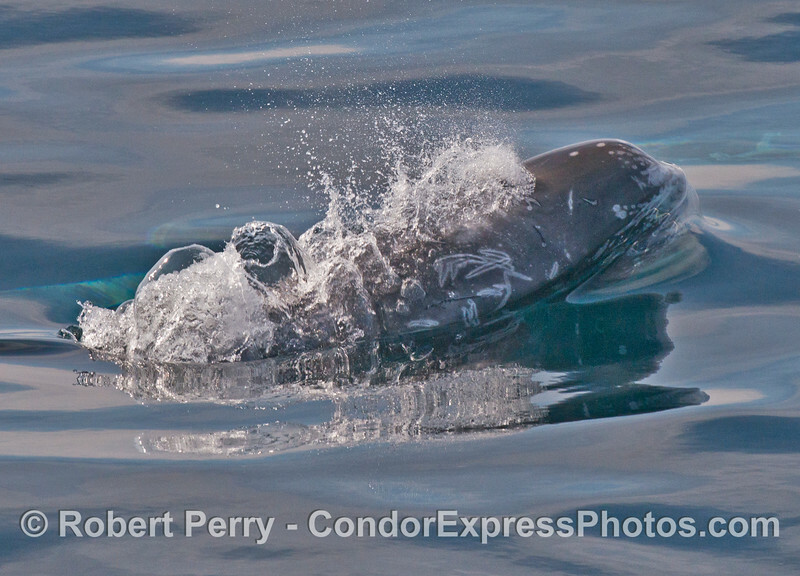 A Dall's porpoise (Phocoenoides dalli) makes a friendly approach. 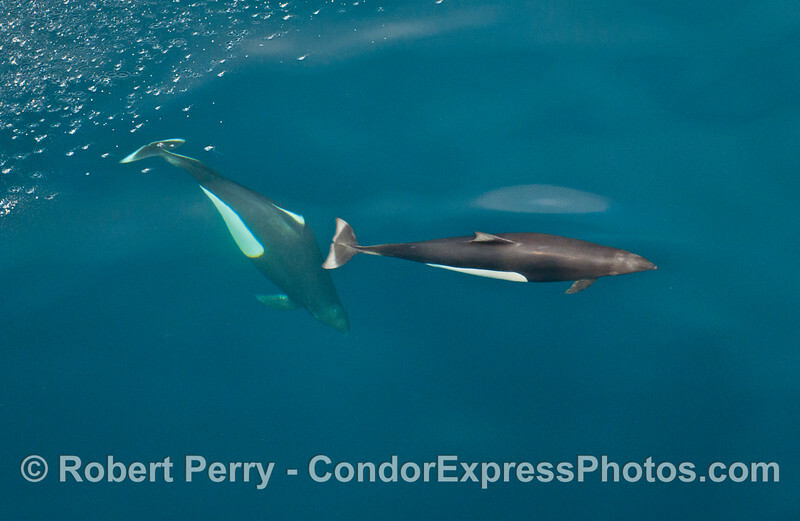 Two Dall's porpoise (Phocoenoides dalli) say hi to the humans. 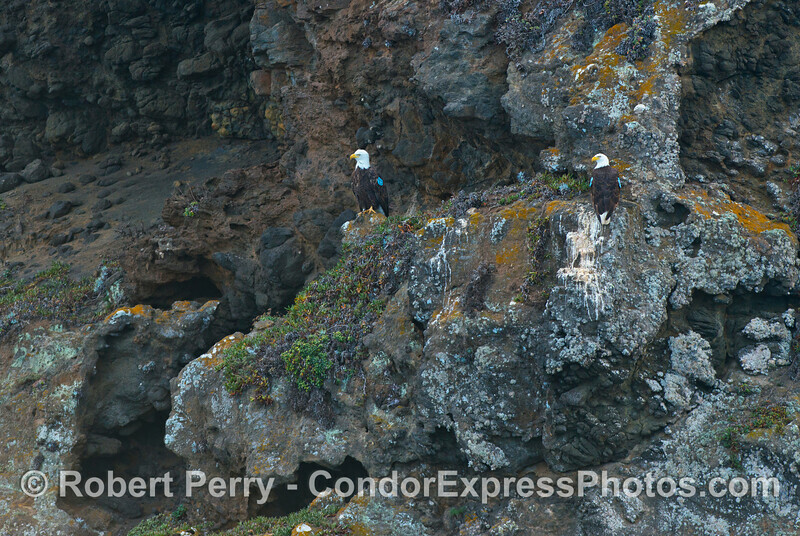 Two Santa Cruz Island bald eagles #49 & #64 (Haliaeetus leucocephala ) perch on a rocky ledge near the world famous Painted Cave. 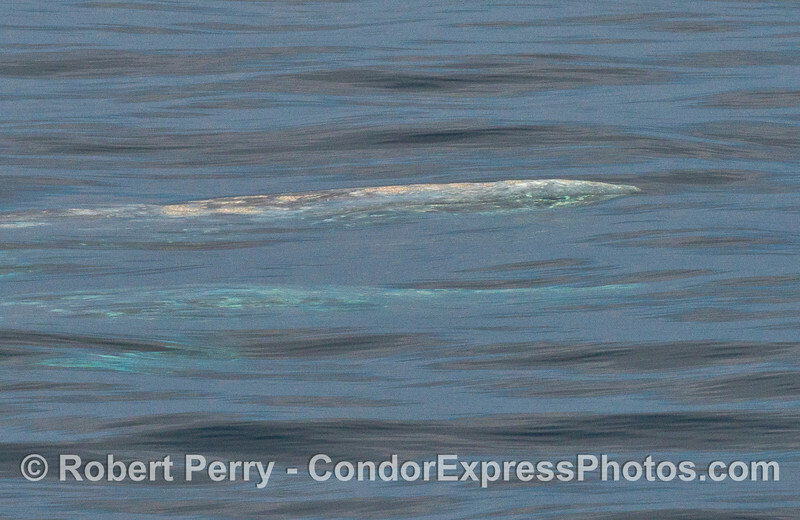 Two gray whales (Eschrichtius robustus), one above and one below, cruise along in glassy waters. 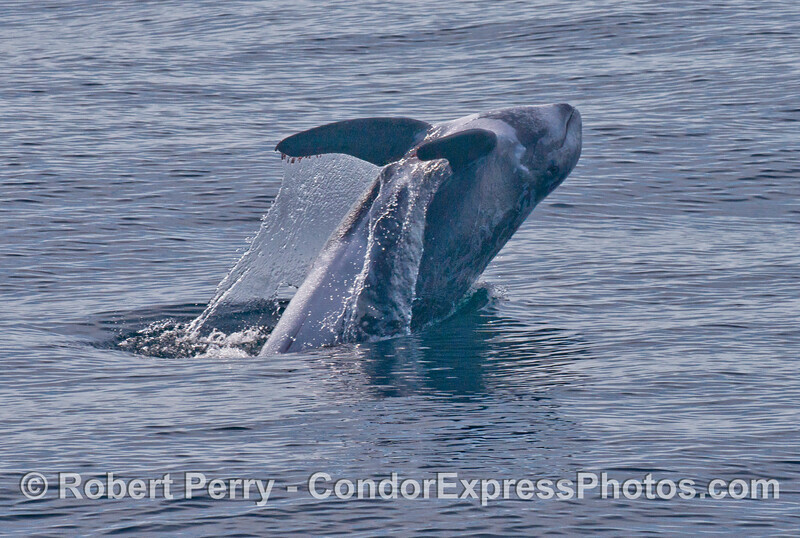 One gray whale (Eschrichtius robustus) dives as another rises up from the depths. 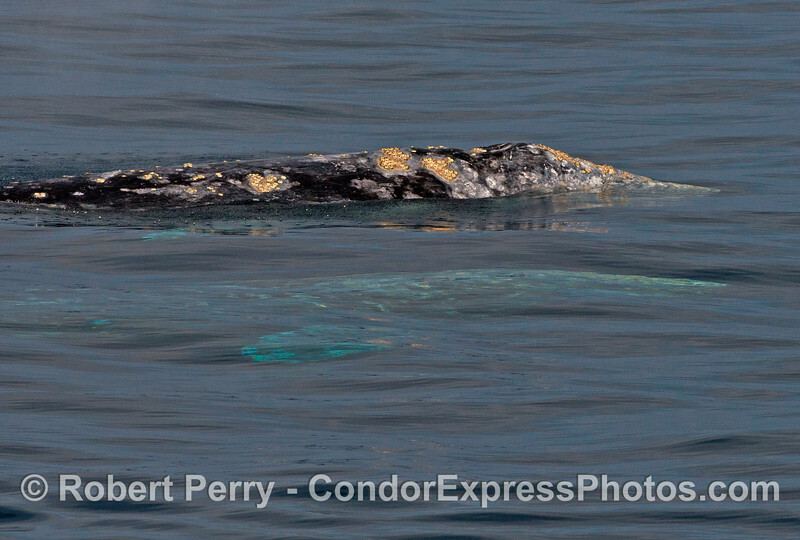 Two gray whales (Eschrichtius robustus) seen under water, side by side. 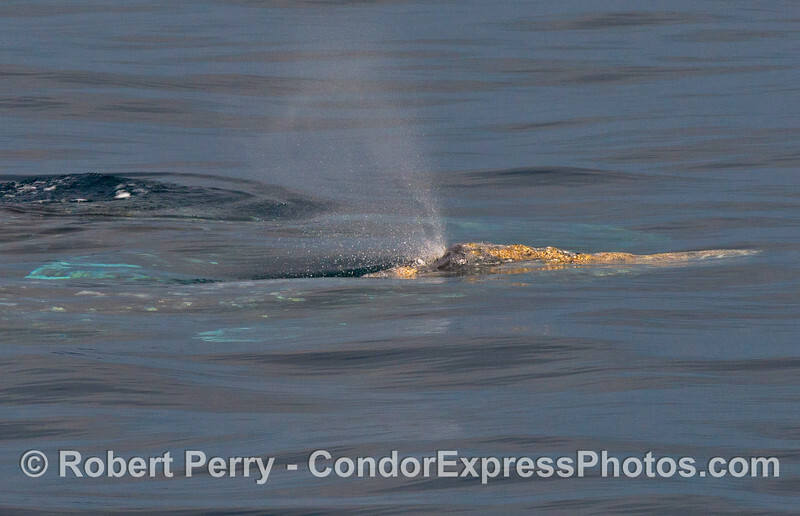 A gray whale (Eschrichtius robustus) spouts. Yellow barnacles festoon the rostrum. 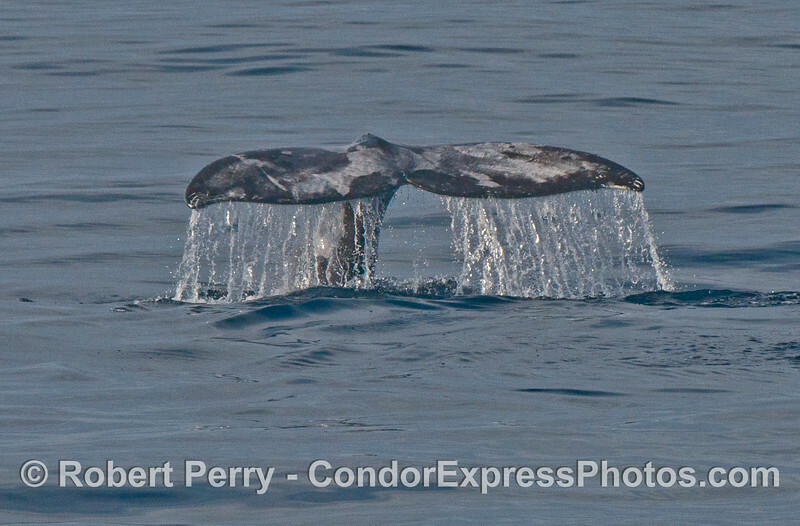 A gray whale (Eschrichtius robustus) tail fluke waterfall. 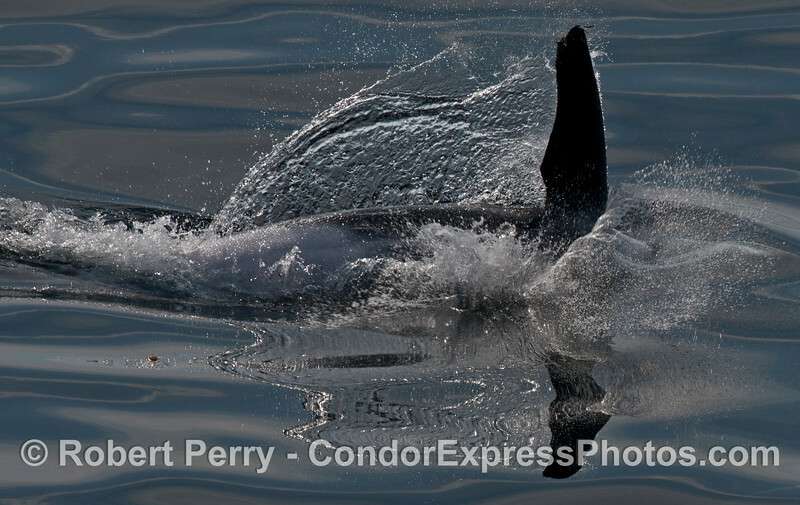 A close up of a breaching Risso's dolphin (Grampus griseus). 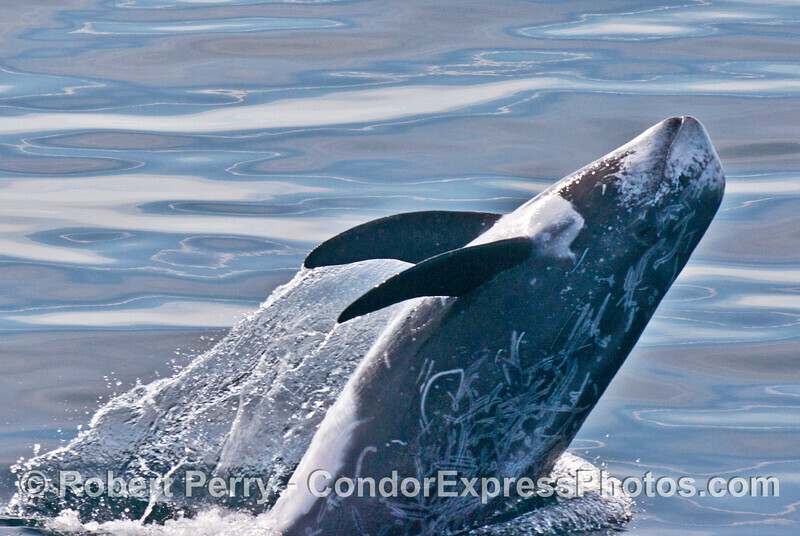 The breaching Risso's dolphin (Grampus griseus) lands on its back. 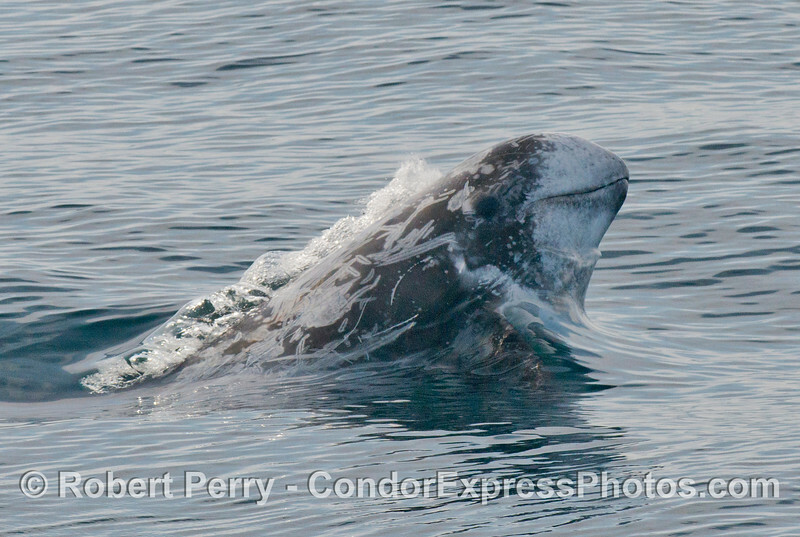 A Risso's dolphin (Grampus griseus) rises up from below as it begins to exhale through its single blowhole. 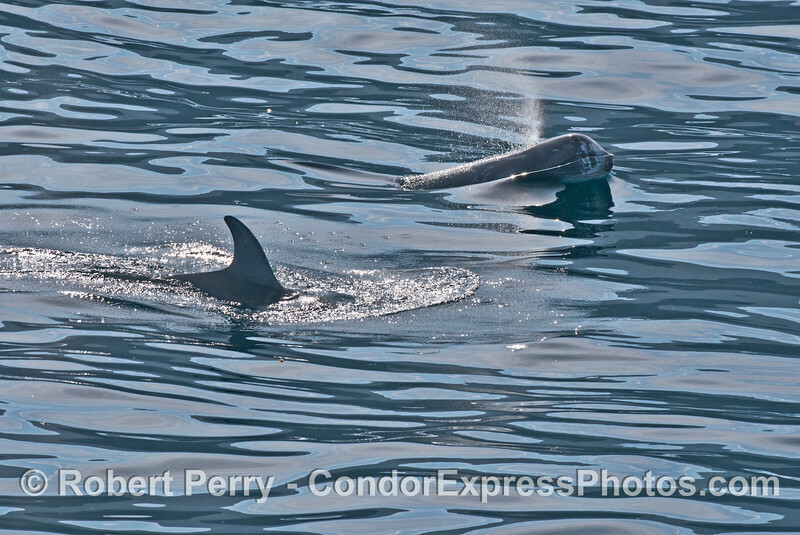 Two Risso's dolphins (Grampus griseus) in bright sunlight. 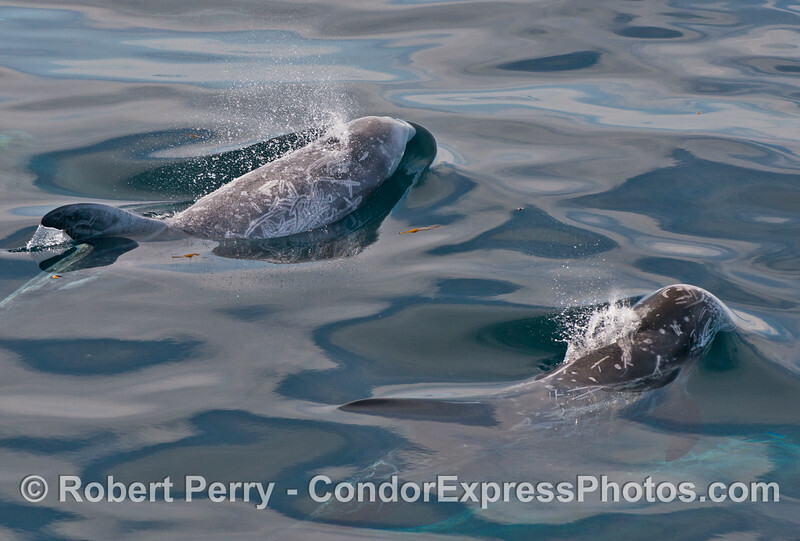 A close look at two Risso's dolphins (Grampus griseus) side by side. 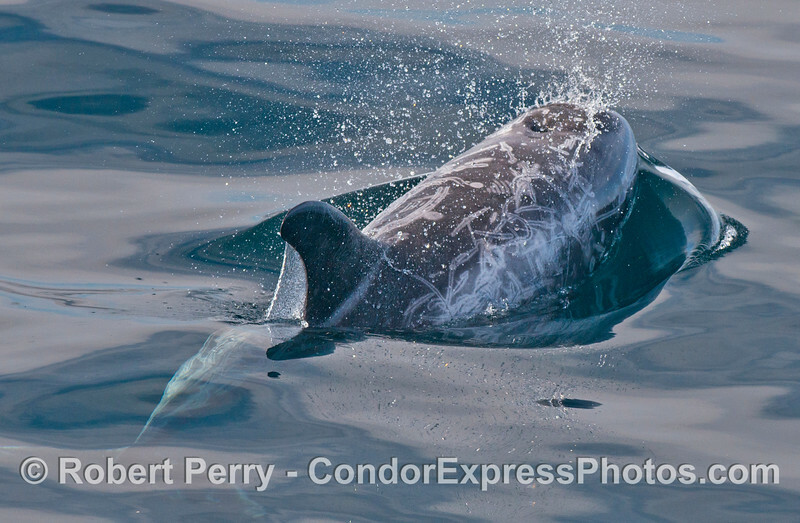 A Risso's dolphin (Grampus griseus) erupts from the water. 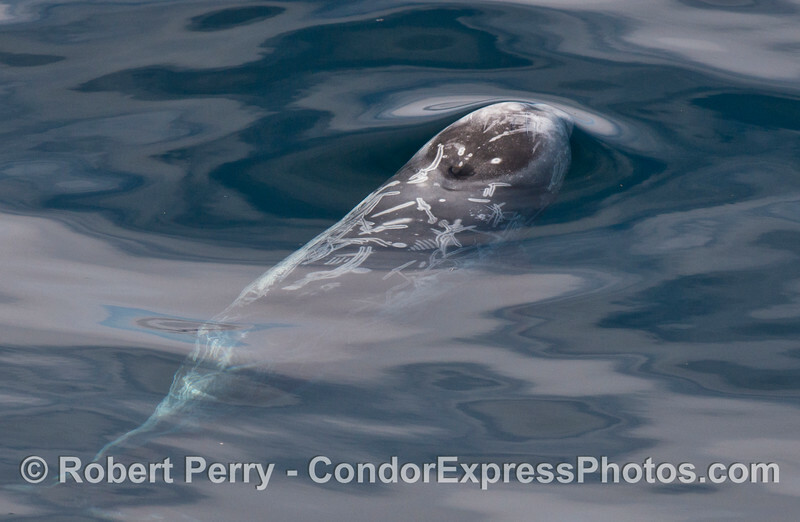 A Risso's dolphin (Grampus griseus) rolls around on a glassy ocean surface. 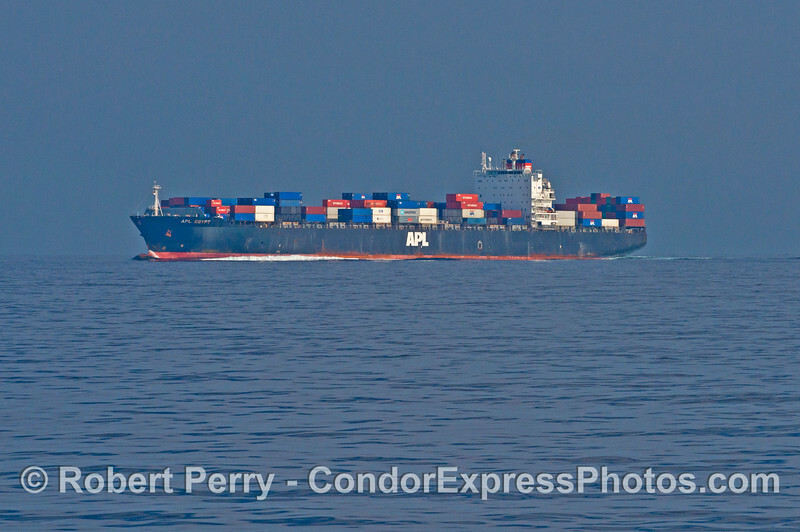 The container vessel "APL Egypt" heads west in the northbound shipping lane of the Santa Barbara Channel.